When avocadoes are in season make this Coriander And Avocado Salad Dressing. This month I was given Kate’s Kitchen as my Secret Recipe Club blogger. Kate is a financial planner by profession, who lives to eat and has therefore learned to cook. Her love for food comes through very clearly on her blog. We have many things in common. We both have husband’s who double as Sous Chef’s, we both love gardening and traveling and we both have step sons. Kate and I have also been blogging since since 2009. I stumbled upon her recipe for Avocado Cilantro Dressing and straight away I knew I wanted to make this. I had just bought some avocado pulp and the recipe called out to me. The dressing can be made in advance and this allow the coriander to really permeate through the ingredients. I used it to make cabbage slaw twice and then I used the last of the dressing for a green salad. I am going to make this again to use with sweet potatoes as I think the texture would work really well. I might even swap out the coriander for some dill, as dill is my favourite herb to use with avocado. what is your favourite herb to use with avocado? I love the flavors here! We’re always looking for new uses for avocado. I’m excited to try this one out! Love the idea of using avocado in salad dressing, sounds good! Wonderful dressing! I love avos with basil! Another flavour combination for me to try! That sounds wonderful – never think to use avocado as the dressing! OH MY!! This looks so good, look at all the wonderful ingredients. It must have such a depth in flavor. Delish!! Ya know, I’ve never thought to add coriander and avocado into a dressing but it sounds positively divine! I love cumin with avocado – or with anything. Hi Tandy! I had a great time browsing your blog this month and loved making your Almond Financiers. So yummy. This dressing sounds fantastic. I love cilantro and avocado so I’m certain they would be delicious in a dressing. Pinned this one for later. What a great choice – looks tasty! Kate has a lovely site full of tasty treats. Glad to be part of SRC with you. What a creamy, delicious looking dip! Kate and I live in the same city…and she’s such a great cook! You picked a winner of a recipe for the SRC…looks delish!!! I agree with Sally the lime would be a wonderful flavor combo, maybe green onions also? This dressing sounds so good. I’m also going to have to try dill with avocado…never had the combination. i’ve never made an avocado dressing before but that it going to change! this sounds great. I made it again last night! We are big Avocado fans! It’s a staple here. What a wonderful dressing! YUM! This looks so fresh and flavorful! I’d love to try it on my summer salads! I looooove anything with avocado. We’re having salad for dinner tomorrow and I know what kind of dressing I’m making! Looks like a very versatile dip1 I am sure you will get lots of use out of this one! It is going to become my go to dip for sure! I love avocado but have never tried it in a dressing. This sounds wonderful and I can’t wait to try it! I love Kate’s site. And, thank you for schooling me. I had no idea that avocado pulp was available. I hope I can find it here. 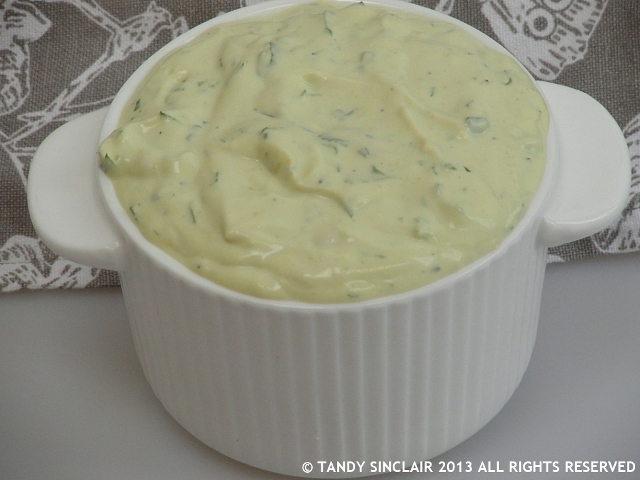 Lots of coriander, fresh lime and salt with my avocado please – love the added creaminess of this dip. Looks delicious. Am bookmarking this recipe to try. This sounds really good, Tandy. I think chives is a great idea too. I am so going to try it this evening! I cannot grow enough of it! Hi, Tandy, wonderful dressing! I love coriander and avocado, chives are an ideal companion as well. Anything to offset the heaviness of avocado. I’m an avocado fan but haven’t done anything with it besides make guacamole and chop it up into salads. This dressing sounds so good! I’ve never tried dill with avocado and now I think I must.